Cooling of the recirculating mold material (used sand) during sand conditioning. Measures for sandcooling are especially necessary for high mold utilization and high cycle times. After the used sand is unpacked, it has a temperature of up to 200°C which is unsuitable for further processing. Target mold sand temperatures lie at < 40°C. If temperatures lie above this, a range of disadvantageous effects occur, such as uncontrolled evaporation and therefore drying out and condensation, both on the cooler cores and in the mold.< 40 °C. Liegen die Temperaturen darüber, treten eine Reihe nachteiliger Effekte wie unkontrollierbare Verdunstungen und somit Austrocknungen, Kondensationen sowohl an den kühleren Kernen als auch in der Form auf. Warm sands also slow down the absorption of water by the bonding clay on the shell layers of the sand body, cause increased evaporation losses between conditioning and the mold location, cause a tendency to stick to the models and, due to their instability, lead to casting defects caused by the mold. The risk of rejects increases, meaning that used sand cooling is necessary for economic reasons. The cooling of used sand which is still hot can be best achieved using the principle of vaporization. Spraying water and ensuring good ventilation can take away a large part of the heat. The vaporization of 1 % of water brings a cooling of around 27K. A cooling of the mold material through ventilation alone is less effective, as its heat absorption capacity is low. The cooling air mainly serves as a medium to transport the water vapor. The determination of the amount of water and air required for vaporization can be formalized via three calculation steps of a combined energy-water balance and can be represented in a diagram. In the first step, the energy balance is used to determine to what extent the heat energy is to be removed. This specification can be used in the second step to determine the water needed for vaporization. The third step specifies the air needed in order to be able to remove the vaporized water. Therefore, for example, for a used sand flow rate of 80t/h and a cooling from 100°C to 40°C (ΔT = 60K) and for a specific heat capacity of quartz sand with c = 0.84 kJ/kgK , a heat energy of Q = 4.03 GJ is to be deduced. The energy required for the evaporation of one liter of water at 15°C is 2,613kJ, from which a water demand of 1,543 liters can be easily calculated. As a basic formula, to cool around 30K, a water demand of 1% is required. Transfered to the example above, this is then 1,600 liters. Air is required for the vaporization, whereby this process should not be confused with evaporation, if water has exceeded the boiling point. The determination of the air demand depends on the temperature. With increasing temperature, the water absorption capacity of the air increases in a nonlinear way. While, until then, the computation techniques were characterized by physical laws, an advance calculation of what temperature the extracted air must have is not possible. The attainment of the extracted air and sand temperature is characterized only by the construction of the cooler. 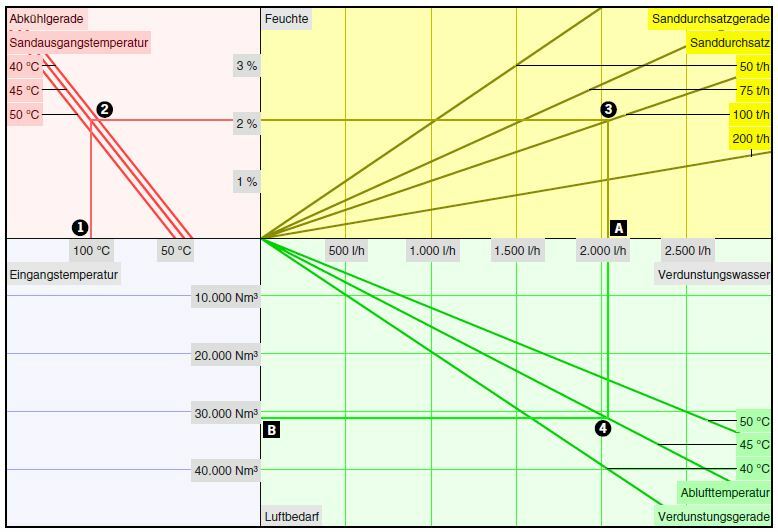 Therefore, for example, the calculations for three extracted air temperatures 40°C, 45°C and 50°C are carried out and displayed in a diagram (Fig. 1, datec Dosier- und Automationstechnik GmbH), in which the calculation is implemented graphically in each quadrant with a linear relationship. In the upper left quadrant of Fig. 1 (datec Dosier- und Automationstechnik GmbH), three temperatures are applied which represent the cooling. They differ in the cooling temperatures which are to be achieved of 40°C, 45°C and 50°C. The operating point which is to be entered is then the input temperature. Based on this, the straight line is chosen which ends at 40°C as the discharge temperature and starts at an input temperature of 100°C. These are points 1 and 2 in the cooler diagram. Straight lines for different flow rate amounts are entered in two quadrants. They intersect the horizontal lines, whereby the point of intersection on the y-axis is the result for the required coolingmoisture. This straight line ends in the chosen amount of sand (point 3). In the third quadrant, the vaporization degrees for the extracted air temperatures 40°C, 45°C and 50°C are shown. The three vaporization degrees are intersected by the vertical line which intersects the x-axis at point A which shows the water demand for the vaporization. The air demand can then be determined in point B using the y-axis. For this process, it should be noted that the cooler diagram based on an energy-water balance cannot give any information about how well the cooler works. The specification is exact enough to determine the amount of vaporized water. It says nothing about at which temperature and with what amount of air this water is removed. The three temperature values for the extracted air temperature are values based on experience from a range of used sand coolers. According to current knowledge, the effectiveness of a cooler is also influenced by the volume, the time the used sand being cooled spends in it and the outside temperature for possible heat transfer.